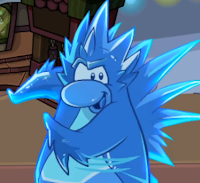 I've got another sneak peek for the Prehistoric Party that will be hitting Club Penguin in January next year, because Spike Hike won't stop teasing us! He has now revealed the new feature that will be coming to the party, turning into a dinosaur, which you can tell I'm happy about! He tweeted that us penguins (members only) can fly, stomp, and roar around the island, and posted this picture. All of these sneak peeks are getting exciting for us. What's next? A new Club Penguin log off screen has been spotted! It is an advertisement for the newly planned Prehistoric Party that will be hitting the island in January 2013. The official release date as well as some other information has been released in this log off screen. The party is supposedly about penguins living in the prehistoric times with dinosaurs and such. Check it out below! 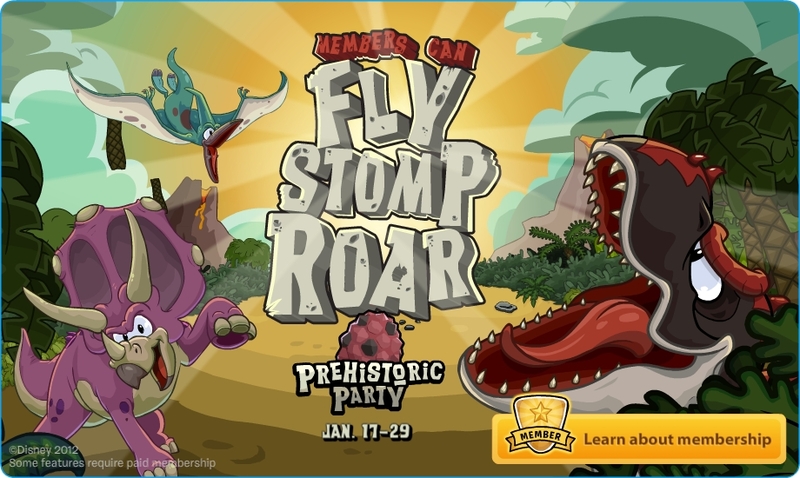 It says that members can FLY, STOMP, ROAR. Maybe suggesting they can being DINOSAURS? That would be so cool! Anyway, the party is launching on January 17th and it will be running until the 29th of that month. Are you excited for the Club Penguin Prehistoric Party 2013? Leave me a comment below. 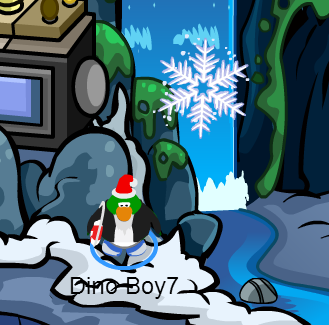 Whilst waddling around the island of Club Penguin admiring the Holiday Party 2012, I stumbled upon Rockhopper's Ship. I hopped on board and noticed that in the Captain's Quarters there was a game called Treasure Hunt, which I remember from old times. I decided to play it but since the ship was empty and there was no one to play with, I thought I'd test a glitch I remember out. When playing Treasure Hunt, if you move the game window to the side, you can actually walk around the room without having to exit the game, and here's how. 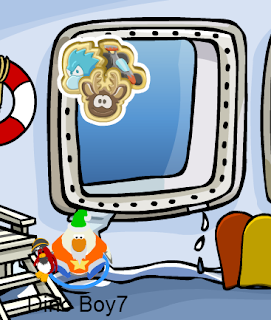 Load up your game on Rockhopper's ship and while you're playing (or loading in my case), move the game to one side of your screen and click on another Treasure Hunt sand box. You'll find that you are able to walk from one place to another, provided that you are only clicking on sand boxes. BONUS: You can also walk to the exit door while still digging for treasure! 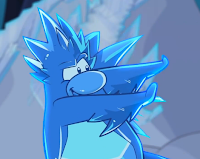 What do you think of this latest Club Penguin glitch? If you would like to let us know, please consider leaving a comment down below! Wow penguins, just wow. 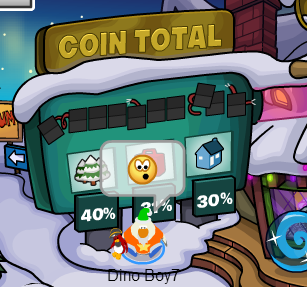 I believe we have donated so many coins to Coins For Change that we have broken the counter on Club Penguin! It's gone completely offline at the Snow Forts. Check it out. I don't know whether we should be happy that we donated so much, or sad that we broke it. Either way, congratulations! For more Club Penguin cheats, just go to the homepage and scroll down. Peace out! Every fortnight (two weeks) on Club Penguin, a brand new collectible item called a pin is released. A pin is something penguins can wear on their playercard or collect in their inventory, but you probably already know what they are, and you're here to see the new cheat for the Holiday Cookies Pin! Below is a step-by-step guide. Enter the Cave through the Manhole cover. Waddle over to the left by the window. Click the Holiday Cookies Pin. Congratulations. You now have the newest Club Penguin pin! Be sure to share this post on Twitter and Facebook, spread the cheats! 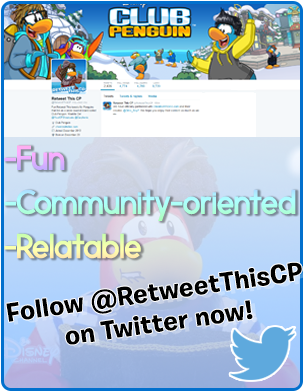 The 375th issue of the weekly Club Penguin Times newspaper is here and it is a very special edition. 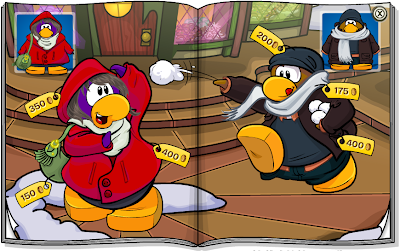 We have articles from famous penguins such as Rockhopper, and all sorts of exciting news and updates from the very author of the newspaper, Aunt Arctic. Without further ado, here is the new Club Penguin newspaper. Happy Holidays everyone! 2012 is almost over, and penguins everywhere are celebrating the end of a truly remarkable year! This year would not have been the same without you (yes YOU). So here's our thanks for a fantastic year! 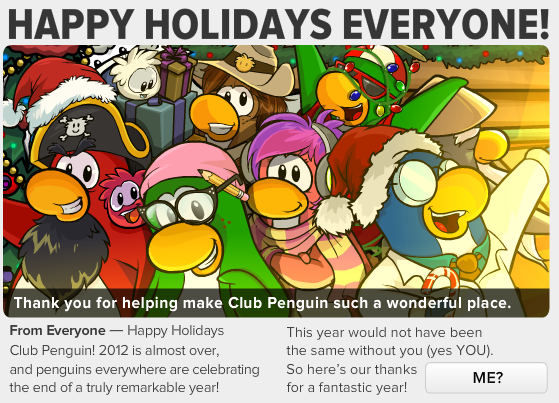 Thank you for helping make Club Penguin such a wonderful place. 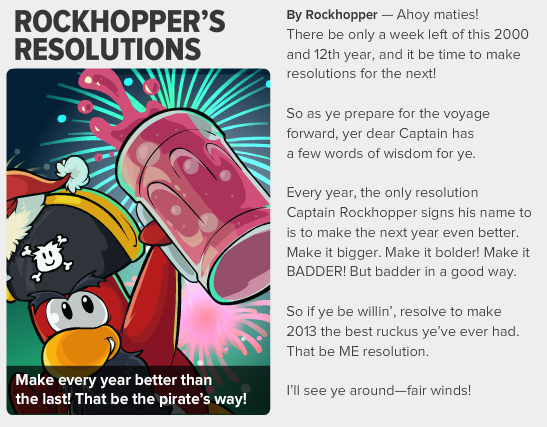 Rockhopper's Resolutions. Ahoy maties! There be only a week left of this 2000 and 12th year, and it be time to make resolutions for the next! So as ye prepare for the voyage forward, yer dear Captain has a few words of wisdom for ye. Every year, the only resolution Captain Rockhopper signs his name to is to make the next year even better. Make it bigger. Make it bolder! Make it BADDER! But in a good way. So if ye be willin', resolve to make 2013 the best ruckus ye've ever had. That be ME resolution. I'll see ye around—fair winds! On now! Holiday Party. Happy Holidays! Don't miss your special gifts—including the new Arctic White color! Jan. 4. Penguin Style. The New Year is here! Time for a new look. The latest fashions are coming to the Clothes Shop. Jan. 4. Scientific Announcement. Gary the Gadget Guy will make an astounding announcement next week. 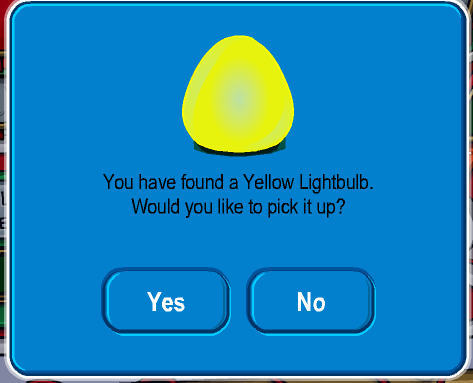 Today on Club Penguin, a brand new penguin color has been released. The color we ALL have been waiting for. Arctic White! Yes, the highly anticipated white color has finally been launched for penguins to wear for free! To get it, log on to Club Penguin and when the gift calendar pops up, click the gift that does not have a member sign by it. The image below should pop up. 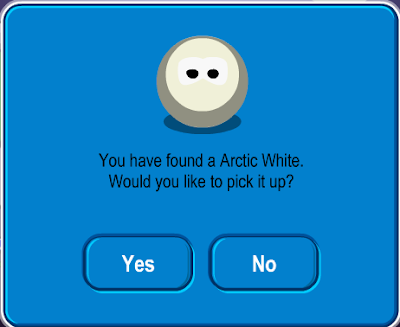 Click 'Yes' and the new Arctic White color will be added to your inventory as shown below. 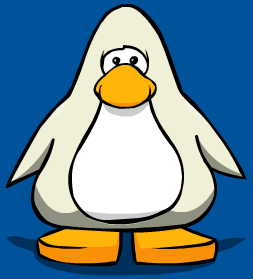 Here's what the white color looks like on my penguin. And on an average penguin. Remember, this color is for all penguins, member or non-member, new or old players. 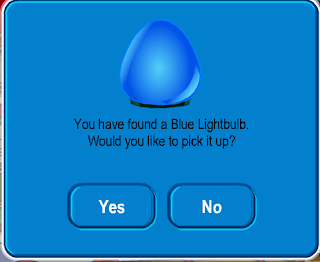 I remember when the Aqua color was released, and we had to vote if it should be the next color in the Forest, good CP memories. What do you think about Arctic White? Was it worth the wait or not? 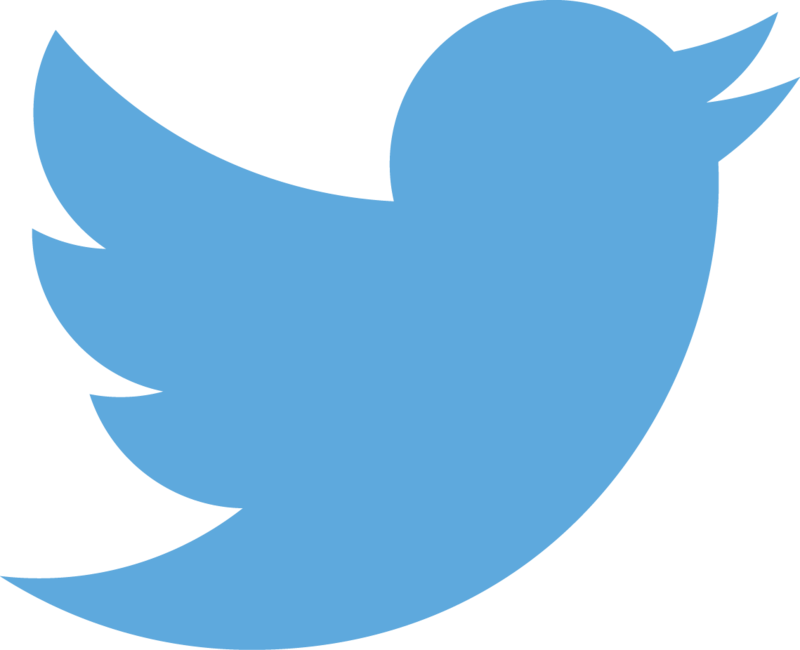 I would love to hear your feedback, so tweet me or leave me a comment. Hello penguins! 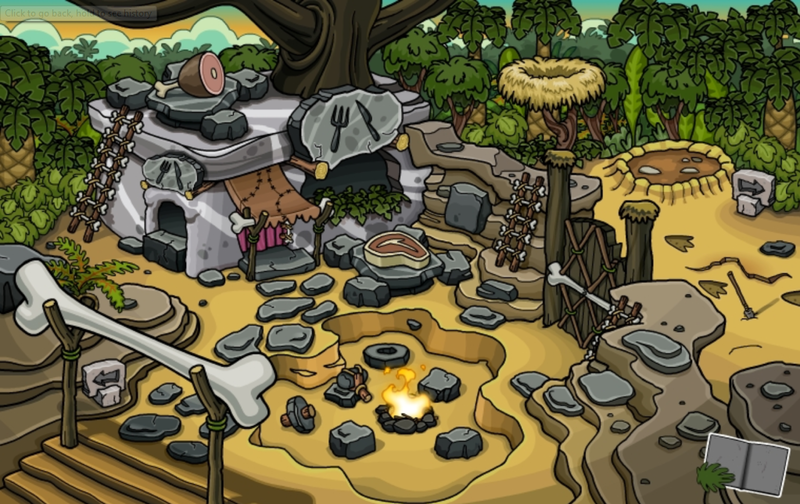 Today, I have found an exclusive sneak peek of the Club Penguin Prehistoric Party coming in 2013. Spike Hike posted a preview image of what the Plaza will look like during the party. He said in honor of 10 billion coins being donated to Coins For Change, he will give us a sneak peek. This is the Prehistoric Plaza!! This is awesome, I can hardly recognize the area! I think the Prehistoric Party 2013 on CP will be great. Also, it is a completely new original party from Club Penguin. What do you think it will be like? Leave a comment. Hello penguins! Today I recieved an email from Club Penguin with their latest membership offer. From December 21-24 if you buy one membership, you'll get another month absolutely free! It is called the "Buy One Get One" offer, it's on for a very limited time, so hurry! 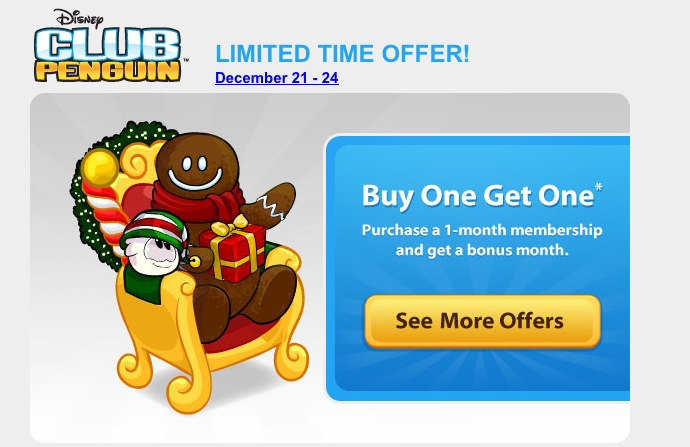 Club Penguin are releasing this offer for the Holiday Party, hence the Gingerbread man and festive white puffle image. Happy Holidays penguins, stay safe! Deck the halls with boughs of holly! The official Club Penguin Holiday Party 2012 is HERE! There are many fun things to do on the island, and I'm sure you don't want to miss out on a single thing. 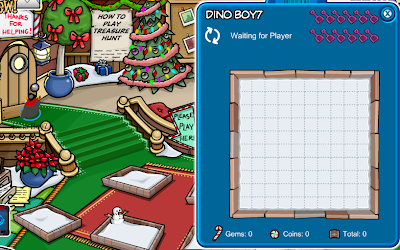 That's why I've created the ultimate CP Holiday Party cheats guide. Below are a number of links you can click to know more about this party, and read cheats for particular games and features. 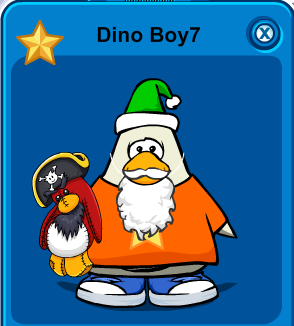 Upon meeting Rockhopper on Club Penguin, you can click his playercard and obtain a free background. Every time our old pirate friend comes to town, his free background changes. This month it is the majestic captain standing on a mountain of coins in the Lighthouse, supposedly advertising Coins For Change 2012. 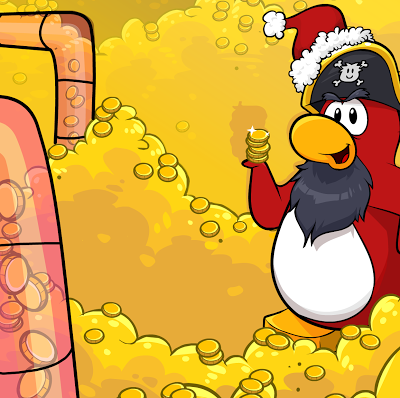 What do you think of Rockhopper's new December 2012 giveaway background? I think it's great, I hope you are all enjoying the Holiday Party too! Club Penguin Winter Emoticons Are Here! As promised, the brand new Club Penguin winter emoticons for the Holiday Party 2012 are here. According to a Club Penguin wiki, emoticons/emotes are little faces and symbols that can symbolize how penguins feel. They usually appear in speech bubbles accessed by clicking on the "Emote Menu" or by pressing "E", followed by various keys. There are only three new emotes. However, two of them are animated! Let's check them out, shall we? The new emoticons are the Cookie Emote, Frozen Emote, and Falalala Emote. The cookie gets eaten when displayed, and the music notes jingle about, whereas I believe the frozen emote doesn't do anything. Happy Holidays! 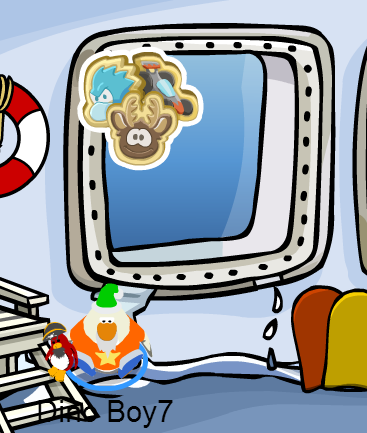 Rockhopper has arrived on Club Penguin, and docked his Migrator at the Beach. 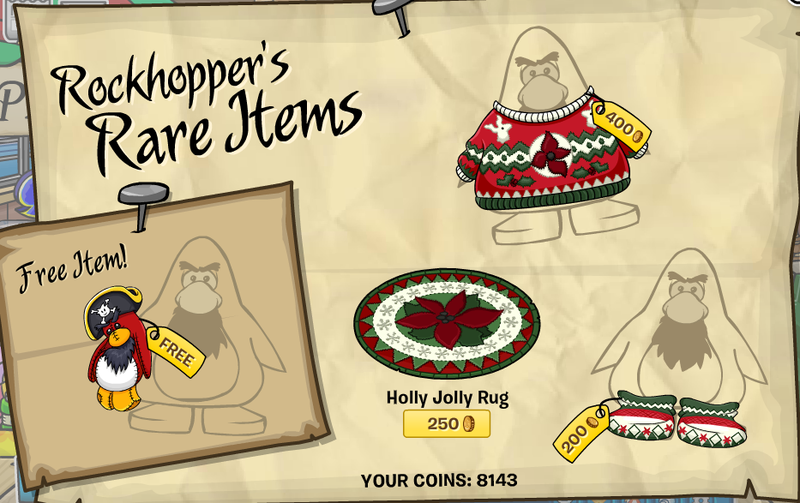 Upon entering his ship, you can obtain free and paid items in his rare items catalog for December 2012. What have you bought from Rockhopper's Rare Items catalog on Club Penguin this Holiday Party? 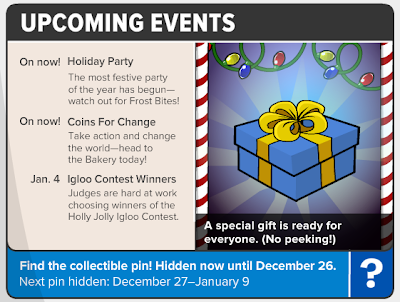 The Club Penguin Holiday Party 2012 has returned with some more frosty features and snowy specials! One of them is the returning Santa's Sled at the Ski Lodge. It is a game where you are riding a sleigh and you must drop 15 presents into penguin's chimneys to win three separate prizes! This years prizes are the yellow blue and pink lightbulbs, collectible after every 15 presents are dropped! Are you enjoying the Holiday Party 2012 on Club Penguin? Leave a comment. 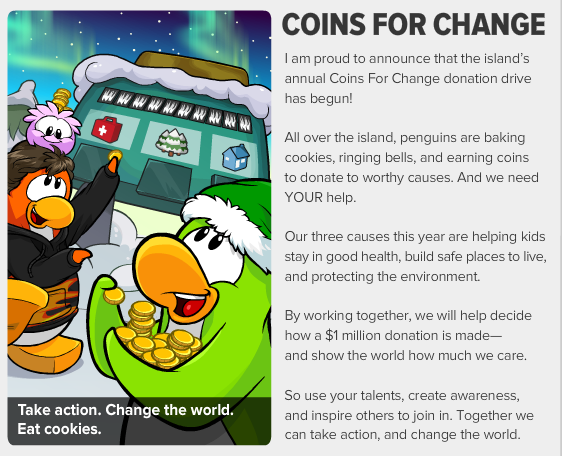 Another year, another Coins For Change donation drive on Club Penguin! This years CFC is fully up and running. You can donate coins to one of three causes, and get excellent prizes in return. 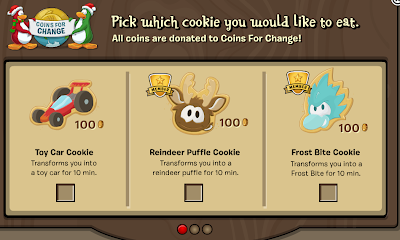 Here is a full Club Penguin Coins for Change 2012 walkthrough guide. 1. Head on over to the Snow Forts. 3. Click on the CFC stand and pick a cookie. 4. The 'Toy Car Cookie' turns you into a car for 10 minutes. 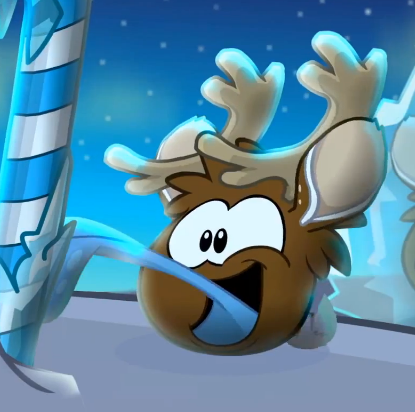 The 'Reindeer Puffle Cookie' transforms you into a reindeer puffle for 10 minutes, and the 'Frost Bite Cookie' makes you a frost bite penguin for 10 minutes. 5. Choose which cause you would like to donate to. Protect the Earth, Provide Medical Help, or Build Safe Places. After that, you should be good to go! 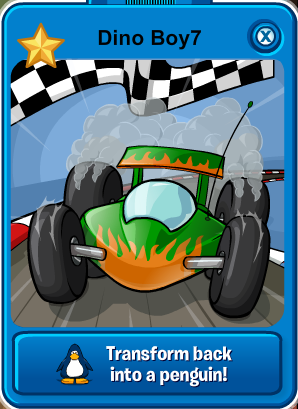 As you can see, my penguin (Dino Boy7) has been transformed into a racing car, cool! 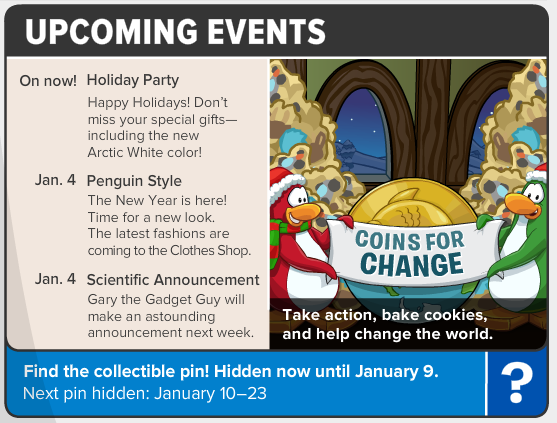 The new installment on the Club Penguin Times newspaper has been released on the snowy island as every Thursday, and this weeks issue addresses the Holiday Party, Coins for Change, and some other important CP news. Avast! Holiday Party! AVAST YE LANDLUBBERS! THE HOLIDAY PARTY HAS STARTED AND IT BE NOT CELEBRATIN' ITSELF! Here be the order of business: I need bakers! I need cookie eaters! Let's raise a ruckus like never before! Coins For Change. I am proud to announce that the island's annual Coins For Change donation drive has begun! 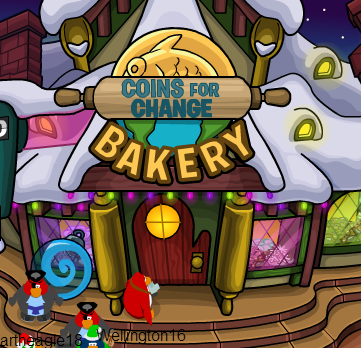 All over the island, penguins are baking cookies, ringing bells, and earning coins to donate to worthy causes. And we need YOUR help. Our three causes this year are helping kids stay in good health, build safe places to live, and protecting the environment. By working together, we will help decide how a $1 million donation is made--and show the world how much we care. So use your talents, create awareness, and inspire others to join in. Together we can take action and change the world. On now! Holiday Party. The most festive party of the year has begun! Watch out for Frost Bites! On now! Coins For Change. Take action and change the world. Head to the bakery today. Jan. 4. Igloo Contest Winners. Judges are hard at work choosing winners of the Holly Jolly Igloo Contest. 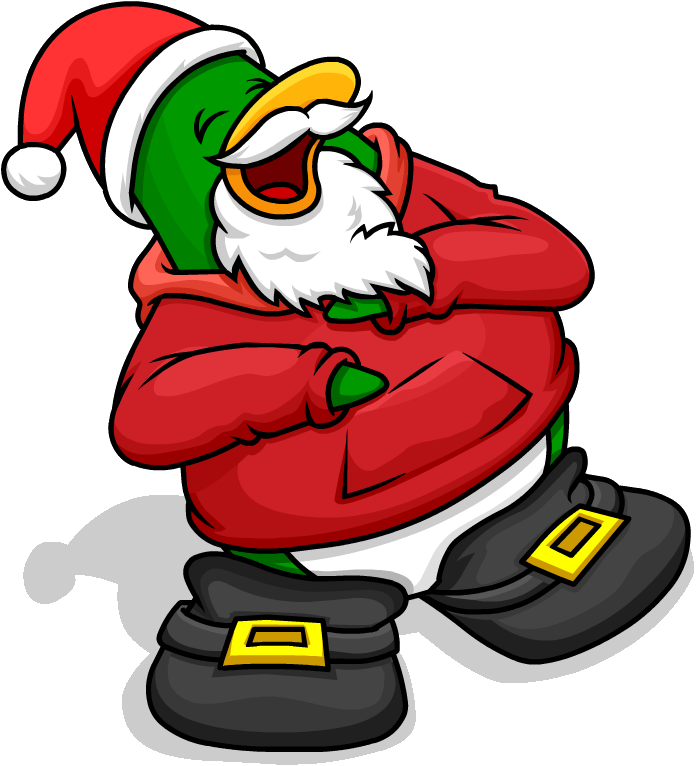 As the party is fast approaching, Club Penguin has released the official Holiday Party 2012 logo. It is light blue in color and glistening, to give it a frost effect. 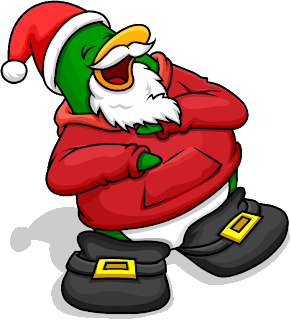 It says "Holiday Party" in one of Club Penguin's popular fonts, with red and blue Christmas lights around the bottom of the logo, very festive. You can view it below. It is basically a redesigned version of the 2011 logo, which was green and red (traditional Christmas colors). What do you think of the Holiday Party 2012 logo? Leave a comment. 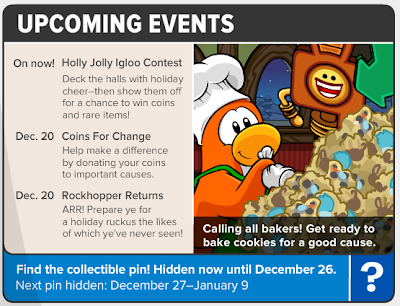 The official Club Penguin Holiday Party 2012 Sneak Peek is finally here! We are shown the awesome party coming to Club Penguin this December. 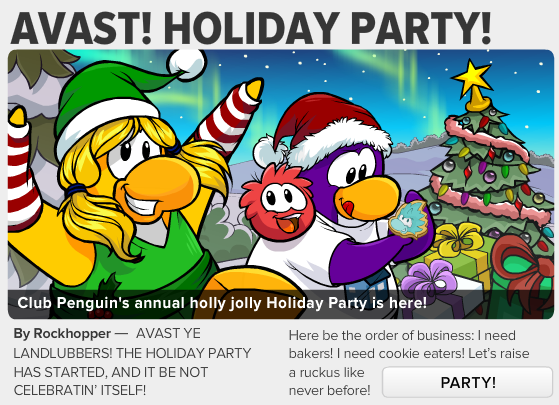 It is set to be the best Holiday Party on CP ever! In the video, we see Businesmoose walking into the Coins for Change Bakery and opening up the exclusive new catalog! 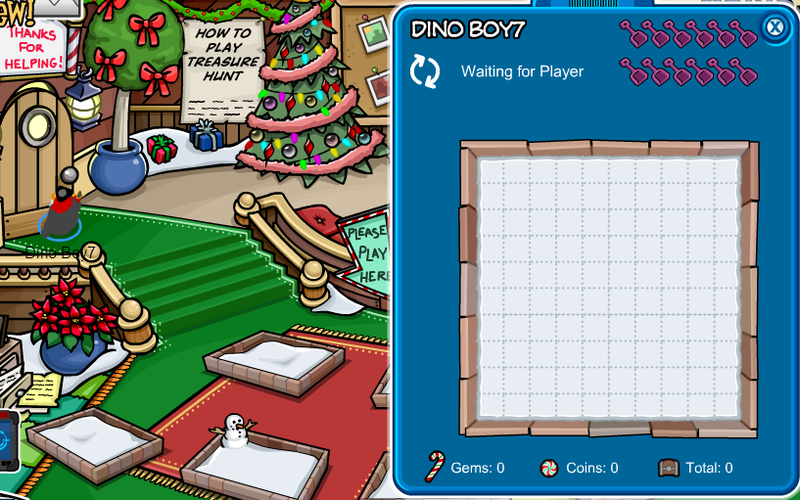 He transforms into a reindeer puffle and sets outside, where he meets Polo Field. 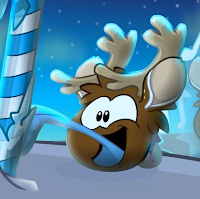 Polo has changed into a frost bite penguin, and he attempts to freeze Moose... the battle is on!! They chase each other around the island until finally, their powers wear off as they enter the Snow Forts. 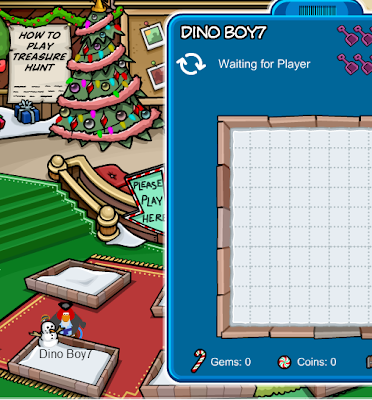 Suddenly, Spike Hike appears out of nowhere and freezes Polo. Payback! What do you think of the sneak peek of the Holiday Party? I think it's great, I love seeing the Club Penguin team entertain us with brilliant videos such as these! Hello penguins! 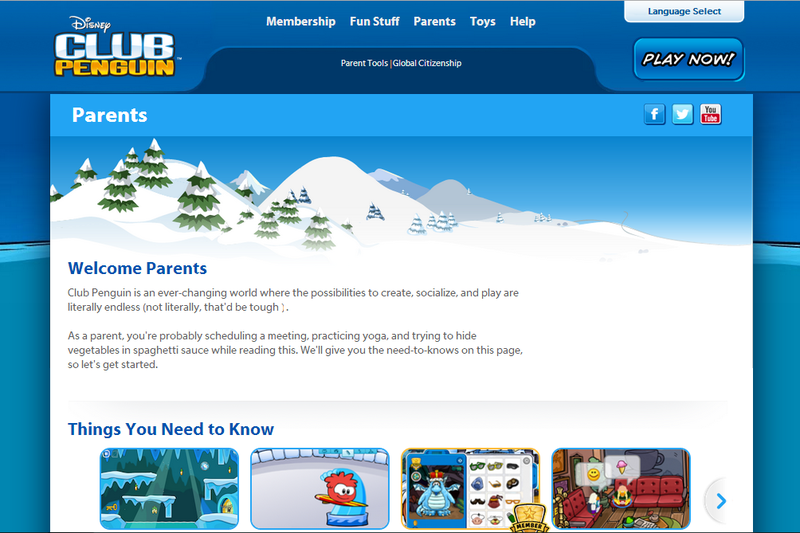 On top of all the exciting new updates and information on upcoming events, Club Penguin have updated the "Parents" page on their website. This is where parents of players can go and read about Club Penguin to judge whether it is safe for their child, and learn more about what is available on the island, such as membership. The Parent page has been completely redesigned from scratch and is easier to navigate. Club Penguin is an ever-changing world where the possibilities to create, socialize, and play are literally endless (not literally, that'd be tough). As a parent, you're probably scheduling a meeting, practicing yoga, and trying to hide vegetables in spaghetti sauce while reading this. We'll give you the need-to-knows on this page, so let's get started. Club Penguin have launched a brand new pin on the island, a pin is a exclusive hidden collectible item released every two weeks. This pin is named the "Snowflake" and it is a perfect fir for the season, especially since Christmas and the Holiday Party 2012 are heading towards the island. Anyway, let's get onto the Club Penguin Snowflake Pin Cheat. 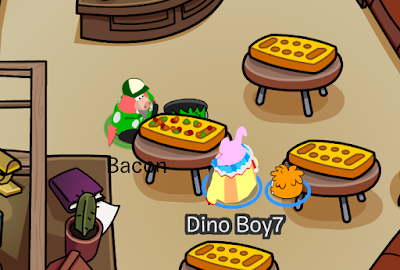 Enter the Mine and go to the Cave (next to the Puffle Rescue game). Go to the far right near the waterfall. Congratulations! 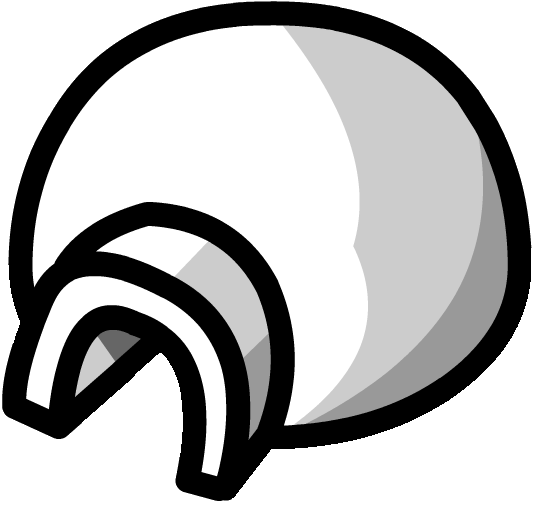 You now have the newest pin on Club Penguin, the Snowflake pin! Club Penguin Video: Join the Holiday Party! Club Penguin have just uploaded a new video called "Join the Holiday Party! 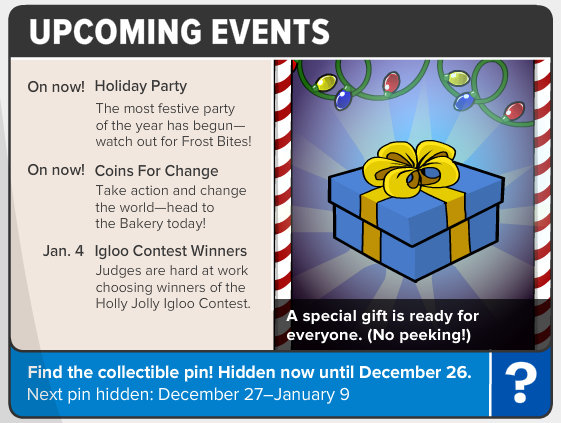 [Official Club Penguin]" in which they advertise the Holiday Party 2012 on the island, along with all the exclusive features! This year for the holidays, giving changes everything. Between Dec. 20 and Jan. 2, when players give virtual coins to Coins For Change, they'll get the power to transform! Everyone can become road racers. 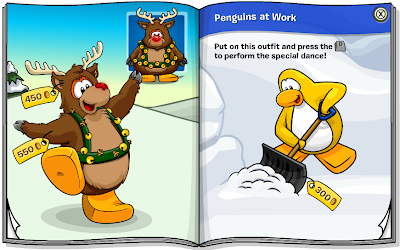 And members can turn into reindeer puffles, or icy penguin Frost Bites that can freeze their friends! WOW! I am so glad the Arctic White color is finally going to be available for penguins, and what a greater time to release it during the Holidays! Also, the race car, reindeer puffle, and jack frost penguin ideas look pretty sweet. What do you think?? The newest installment of the weekly Club Penguin Times newspaper is finally here, number 373! Of course, it's all about the Holidays! The articles in this edition are all about Rockhopper coming to town, the Christmas Igloo Contest, and the upcoming events and parties so you can stay up to date on the island. Cookies For Change. Rockhopper's on his way with a special, magical cookie recipe! Hello readers! Are you kooky for cookies? Batty for baked goods? Sweet on sweets? Well, get ready! 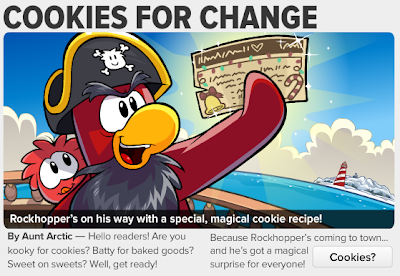 Because Rockhopper is coming to town... and he's got a magical surprise for everyone! Holly Jolly Igloo Contest. It's time to deck the halls with holly boughs, jolly bows, and jingle bells! 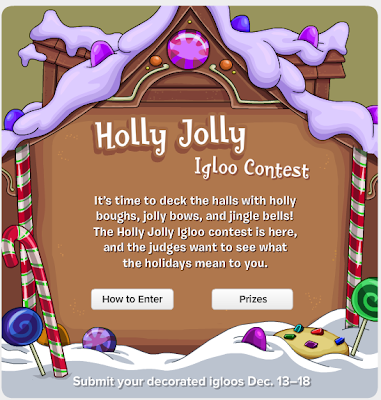 The Holly Jolly Igloo contest is here, and the judges want to see what the holidays mean to you. Grand prize winner: 6 rare igloo items and 1,000,000 coins! 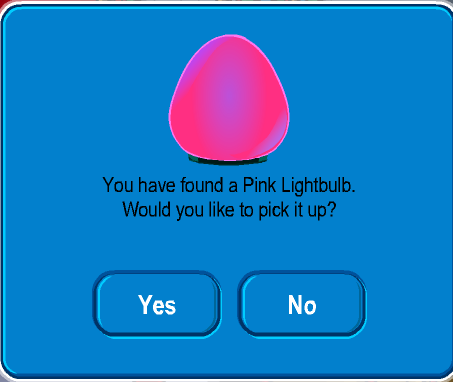 Second prize: 3 rare igloo items and 10,000 coins! 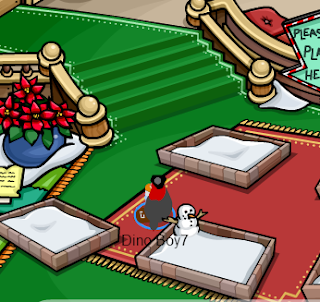 Third prize: 1 rare igloo items and 1000 coins! On now! Holly Jolly Igloo Contest. Deck the halls with holiday cheer, then show them off to win coins and rare items! Dec. 20. Coins For Change! Help make a difference by donating your coins to important causes. Dec. 20. 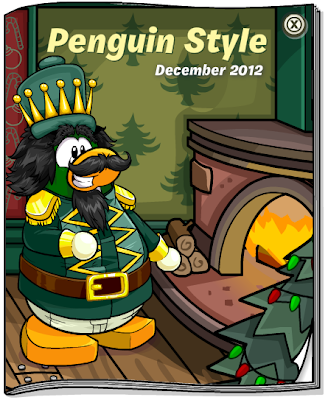 Rockhopper Returns. ARR! Prepare ye for a holiday ruckus the likes of which ye've never seen! 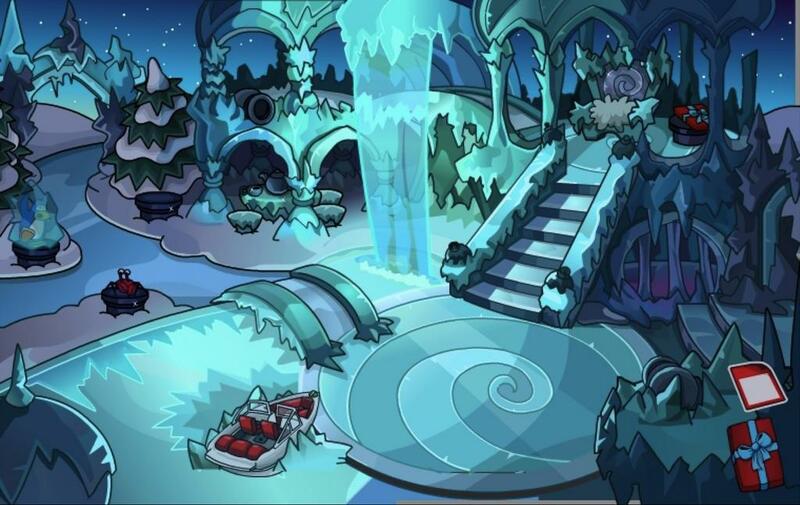 Spike Hike from the Club Penguin Team has published a sneak peek tweet of a new room that will be hitting Club Penguin during this years Holiday Party. The room is called Frost Bite, it is a transformed version of the Dock. This room has many interesting features. You can view the picture below. As you can see there is frozen penguin with the rare old blue colour in the left corner. He is posing exactly how Gary was when frozen by Herbert during Operation Blackout. There is also a frozen waterfall and a staircase made of ice, cool! (literally). What do you think of the new room coming to the Holiday Party 2012? I think it is great, and Frost Bite is a very creative name for it. Do you agree? Leave a comment. The popular Ice Rink has returned to Club Penguin for the Winter season, and the brand new edition of the Snow & Sports catalog has been released for December. Sadly, there are no new hidden items, but the clothing range is brilliant for ice skating and playing in the snow. 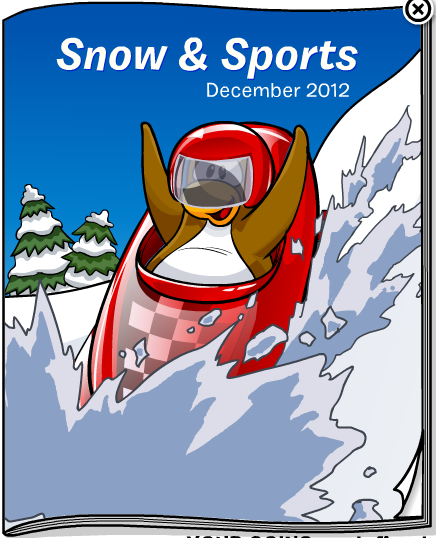 Here are the Club Penguin December 2012 Snow & Sports Catalog Cheats. The first page has the Green and Red Bobsleds with helmets, perfect for racing your penguin friends in! 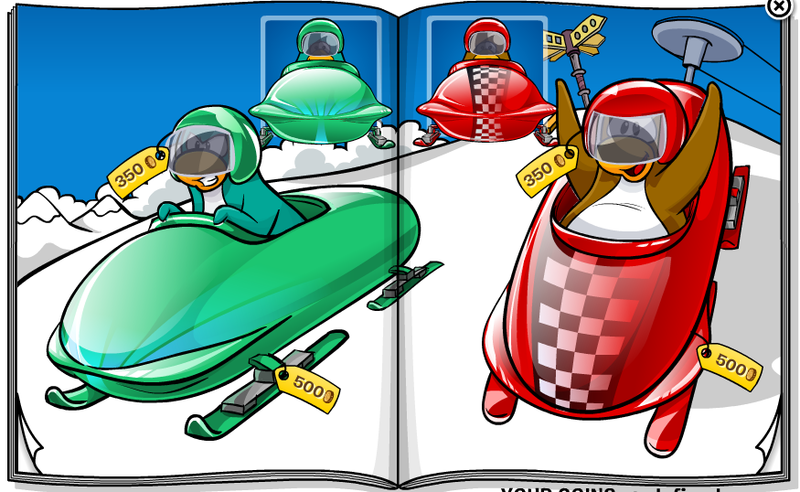 On the second page we have the Sweet Ski Suit with mittens and a beanie, and the Cool Ski Suit, also with gloves and a cool beanie. That's it for this months catalog. What do you think of the rocking costumes? I think they're great, so be sure to head on down to the Ice Rink to buy them and show off your gear to some buddies! It's December. 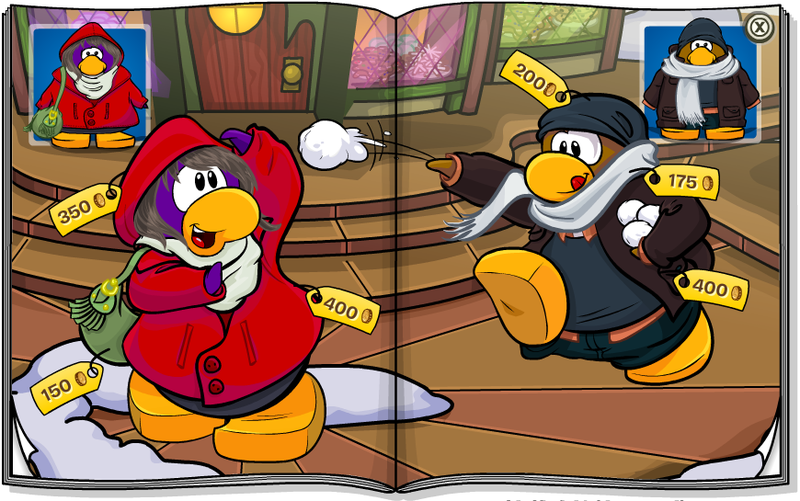 And you know what that means for Club Penguin, a brand new clothing catalog at the Clothes Shop! This catalog is the 12th and last of it's kind as 2012 is wrapping up. The team have released some wonderful winter costumes, and also new cosy clothes for us penguins to purchase and wear during this cold season. 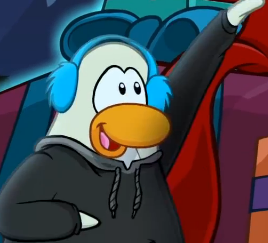 Sit back, and follow my guide for the Club Penguin December 2012 Penguin Style Clothing Catalog. 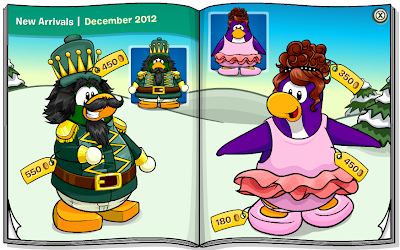 On the first page of the Penguin Style catalog, we are welcomed with The Nutcracker costume (left), and the Ballerina costume (right). As we turn over the page, presented in front of us is the new Red Riding Hood costume and the Warm Red Jacket with a scarf and beanie. Click on the doorknob in the background for the secret; the very rare Pink Bunny Slippers!! The third page has the Black Zip Hoodie with sneakers, scarf and MP3000, and the Baby Blue Shoulder Shirt with the slippers and necklace. Finally on the last page of this months Penguin Style clothing catalog, is the famous Reindeer costume. 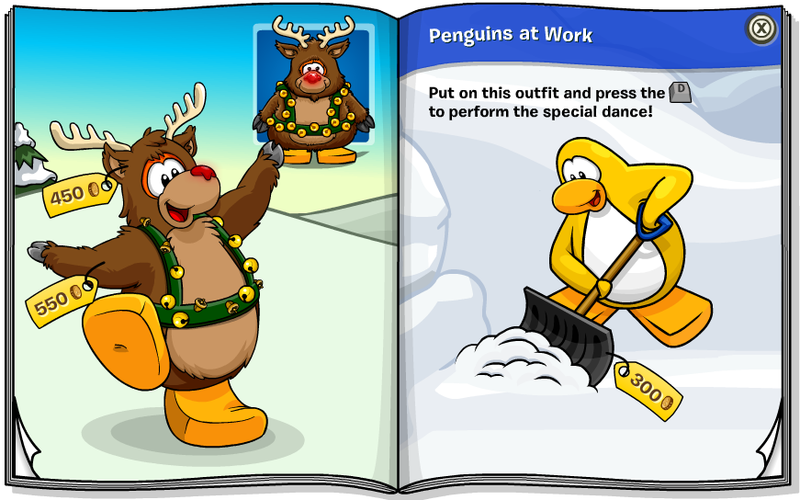 Also, the Penguins at Work, which this time is the Snow Shovel!